ORONO, Me. - The University of Maine men's ice hockey team fell in a close contest to the No. 2/2 UMass Minutemen 4-2 on Friday night at Alfond Arena. First Goal (UMass 1-0): UMass' Marc Del Gaizo handled a pass from his own blueline and took the puck through the neutral zone along the nearside boards. He fired a rising shot that skipped off the tip of Jeremy Swayman's glove and in for the first goal. Second Goal (2-0 UMass): On the power play, Jacob Pritchard finished the play with a stuff in at the post, after Del Gaizo walked the blueline before dishing it off to Ty Farmer whose intial shot was put in. Third Goal (2-1 Maine): Jacob Schmidt-Svejstrup scored his fifth of the season to get the Black bears on the board. Tim Doherty whipped the original shot from the corner before Brendan Robbins held on to the puck in a battle in the slot before whipping it on goal. Doherty and Schmidt-Svejstrup crashed the net, with the freshman converting on the play. Fourth Goal (3-1 UMass): For the Minutemen, Anthony Del Gaizo handled a chip pass and took the puck through center, before dishing off to a clustered Mario Ferraro and Mitchell Chaffee in the zone. Ferraro took the puck in deep while Anthony Del Gaizo sprinted to the slot, where he put in the loose puck. Fifth Goal (3-2 Maine): With the extra attacker in the final minute of play, Patrick Shea won the faceoff back to Alexis Binner at the top of the faceoff circle. 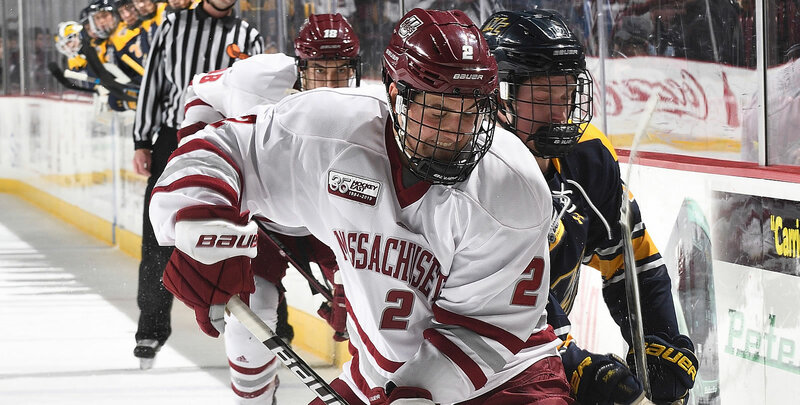 Binner sent a long shot across the slot that hit UMass goaltender Filip Lindberg before popping back out to the top of the paint, where Emil Westerlund fired in the rebound to bring the game within one with 56 seconds to go in the game. Sixth Goal (4-2 UMass): UMass defenseman Cale Makar handled a rolling puck in the defensive zone and fired it the length of the ice for an empty net goal to close out the contest. - Jeremy Swayman finished the game with 39 saves, while Lindberg stopped 25 pucks for UMass. - The Black Bears penalty kill went 1-2 on the night. This is the fifth time this season Maine had two or fewer penalties in a game. - Maine blocked 10 shots during the first game of the weekend. The two Hockey East rivals will do battle tomorrow, Saturday, January 26th, for the second game of the series. Puck drop is scheduled for 7:00 pm.